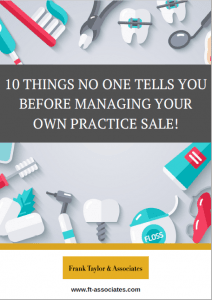 ATTENTION DENTAL PRACTICE OWNERS: Discover the 10 things no one tells you before managing your own practice sale! People tal k a lot about hindsight but so often this is like being told what the weather was like yesterday – it’s too late! This FREE document contains a valuable insight from those who have gone before and managed the sale of their dental practice themselves about the 10 things no one tells you before you start on this journey. Just fill in your details below to receive your FREE copy.